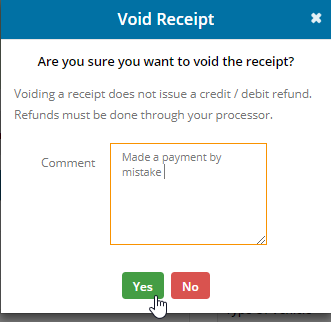 How can I void receipt? Choose "Leases" from the list menu on the left. You will find the lease page appear on grid of information about all Leases. Just click on the Lease you wish to know more about. This redirects you to the main lease page for that particular tenant. Beside each you shall find a small white crossed red circle button. Just drop in the comments that's serves as a note as to why you voided that receipt and hitting on "yes" voids the receipt and throws a pop-up notification for you.